It seems like all winter long we pass our days adding items to the “When It Warms Up” list. When you’re in the depths of winter passing your days coaxing reluctant goats around hock-deep wallows, solid molasses into the feed bowls, vegetables (anything will do!) to grow, and the collection of ramshackle Homestead outbuildings to remain water-tight ‘for just one more winter’, summertime shimmers on the horizon like a magical oasis where anything is possible, the days last forever and, most importantly, you never get tired. While so many of you are battling the rigours of deepest, darkest winter it almost seems churlish that we have a little moan about our lot, but truth is we’d welcome just a wee bit of time out. Yes folks, it official: this week we hit the annual “however much you do, it’ll never be enough” phase of the Homestead calendar. Because it’s not like we’re standing around watching the courgettes grow (and grow and grow). This week, The Milk Maid, Goat Herd and Farm Girl have spent a good dollop of daylight hours in the virtuous act of putting aside for winter (or “preserving stuff” for those less into Ma Ingalls) but our stores are still a tad pathetic. It just seems to us the little huddle of jarred/bottled/frozen produce goes nowhere near reflecting of the amount of finger-nicking, forearm scorching, clothes besplattering we’ve invested. Maybe it’s time to lower our expectations; well, that and stop reading the blogs of canning/preserving/jamming/pickling super heroes. …and grow and grow and grow. As The Renovator moves ever closer to becoming The Teacher, he also frets about the lack of hours in a day and the possibility of ever being ready to front up to a bunch of holiday rested seven, eight and nine year olds. His classroom seems just that much barer than everyone else’s, their ideas just that little bit cleverer. Of course, the rest of us know that he’ll be fine; he’s about to embark on something he was born to do. Like an actor in the wings, it’s in the waiting that the demons lurk. Waiting is something grinding down The Bean Counter as well. His back is definitely improving, he’s moving more freely every day, and his reliance on the anti-inflammatory medication lessening, but mending a back is not a rapid process. It’s very difficult to stand back and watch as trailers are unloaded and the contents stashed; even more so for the person Farm Girl described recently as “the Homestead muscle man who keeps us all safe”. But he’s intelligent enough to know that being kind to his back is the only thing that will fix it – that and he’s a trifle scared of the telling off he receives if he ignores this knowledge. Frustratingly for him, loads requiring stowage keep arriving on the Homestead due, in part, to The Farmer’s recently attained ability (as part of his off Homestead duties) to back a trailer like a pro. Yesterday the trailer was crammed full of bales of hay (word is the lack of rain in these parts will result in a feed shortage), today it was a couple of rainwater tanks. The liberating nature of The Farmer’s new-found skill is mind-blowing and has led to the Homestead now contemplating the purchase of its very own trailer. That’s a project for pondering on another day. The Farmer negotiating the Homestead narrow driveway; Our Hero! Right now life is galloping on and we’re scrambling to make the most of it; and while we’ve been fretting, grumping and disappointing ourselves, the air has resounded to the screech of power tools and the thump of hammer blows. Next comes filling and painting, but for now: how’s this for progress?! Sometimes we manage to do what we set out to, other times we may fall a little short. What we really need to work on is not setting the bar too high. 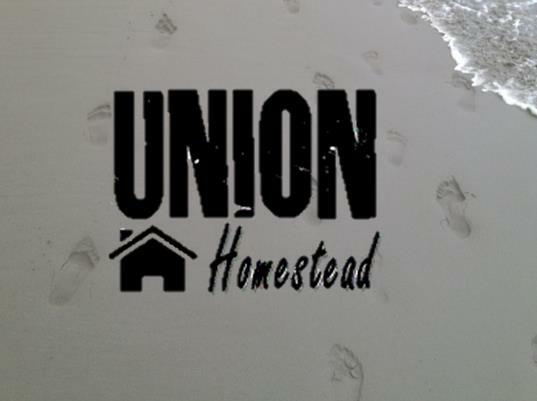 This entry was posted in Family, Garden, Union Homestead and tagged allotment, Aotearoa, backing, backing trailers, builders, building, Christchurch, firewood, garden, gardening, hay, Homestead, Homesteader, homesteading, Lists, New Brighton, New Zealand, organic gardening, Otautahi, planning, plans, rainwater tanks, renovation, renovations, reversing, summer, trailer, trailers, weatherboards, winter. Bookmark the permalink. I have an adjustable bar. I start with it quite high, and then lower bit by bit as I realize I’m not going to clear it. For some things, even just stepping over it is better than what I might have managed had I not set it at all. I’m hugely impressed with the Farmer and his ability to back the trailer. Could he come and teach me? 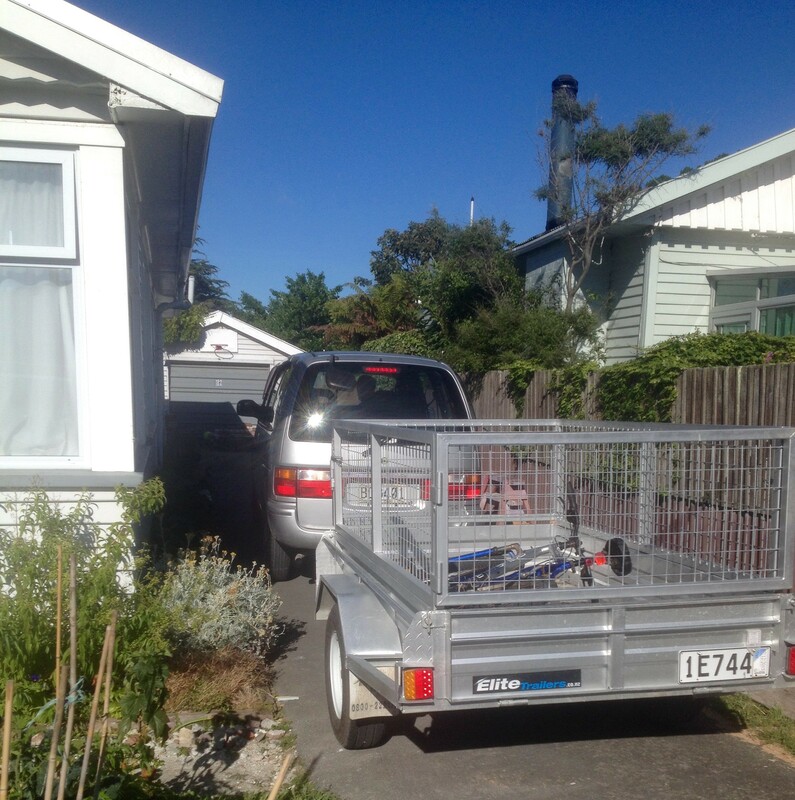 I cannot back up the trailer on my little lawn tractor at all – I usually end up unhitching it and moving it by hand. Only when it’s empty, obviously, as my back is still a work in progress, like Bean Counter’s. I have not been exactly religious about my exercises, and progress seems to have stallled. I don’t want to go back and get a lecture about it, so must get down on the floor and get back to it. Sigh. In the meanitme, look at all the loot Farmer is bringing home! I think Renovator/Teacher is going to find that he has plenty of fresh new ideas – he’s just come from teacher ed after all. And he has Farm Girl giving him live experience :). 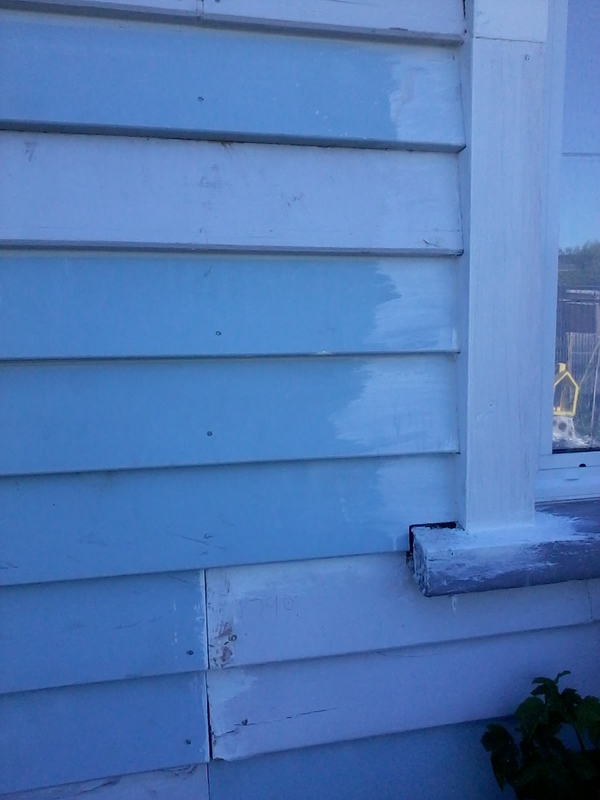 The weatherboard/window repair looks fabulous. Lick of paint, and it will look like it’s always looked like that. I know what you mean about the seasons. I’m getting just a tad tired of mud, but I’m trying to remind myself that I actually work most energetically in these cool but mild temperatures (we’re around 5 C or so these days), and I will wilt come July. For you, It’s probably all those courgettes (you know we call them zucchini? No idea why it’s different – like aubergine being eggplant). There’s a joke here that you mustn’t leave your car doors unlocked during the courgette season, lest someone leave you a whole car load of them without permission. I’ve heard too about the dry conditions in the South Island, hope you get some relief soon. And can I ask you a duck question? How many eggs can a duck lay per day? I’ve got a friend with two Muscovy’s – she got them as pets, but they’ve begun laying, and she says only one duck is laying – 4 eggs/day. That just seems really unlikely to me. I’m guessing they’re both laying, but even so, that’s 2 eggs each per day. Is that possible? I know nothing about ducks, obviously! I’m never quite sure what to call zucchini/courgettes as they seem to go by both names here. I always over plant them as they are one of the things I hanker for mid winter which is totally ridiculous as there is no preservation method in the world that can present me with summer fresh courg/zucc in the middle of winter. We’ve had a couple of 30 degree plus days and I really don’t do well in them. All you can really do is head for a wander down the beach but that doesn’t get the goats milked, gardens weeded or…. You know I’m no duck expert and we don’t have any Muscovys (The Farmer, who has a few lurking on the farm, says they’re dual purpose birds) but I know that our three ladies sometimes give us two eggs per 24 hour period – maybe once every two to three weeks. Apparently they have a shorter cycle than chickens and also don’t power down at night time so we usually discover they’ve laid overnight (ie: before we arrive). But 4…hmmm….I’m with you. Your final comment says it all. An extra good luck wish to the Teacher, his pupils are very lucky since he has high standards too! xoxo from Ohio! I admire someone who can really look after a bad back. That is quite a skill and one which I have nearly but not quite mastered myself. Good luck with the mending.